Mallam Lamido Sanusi Ex Nigeria CBN Gov. Jonathan's directive came against the backdrop of a lack of clarity over who will supervise the forensic audit. Shortly after the Coordinating Minister for the Economy and Minister of Finance, Dr. Ngozi Okonjo-Iweala, suggested the forensic audit of the NNPC's accounts to get to the root of Sanusi's allegation, the Senate Committee on Finance had announced its decision to take over the exercise. The statement stressed that Sanusi’s suspension had nothing to do with his unproven and inconsistent claim that $49.8 billion, $12 billion or $20 billion is missing from the national treasury. "As was clearly stated in the letter suspending him from office and confirmed by President Goodluck Jonathan in his last presidential media chat, Mallam Sanusi’s suspension was wholly based on the need for him to step aside while the weighty charges of financial recklessness, gross misconduct and persistent disregard for laid down rules and regulations in the management of the Central Bank made against him by the Financial Reporting Council of Nigeria and others are properly investigated," the statement said. "In recent days, the suspended CBN governor has, following in the footsteps of others who have an axe to grind with the government, taken to spreading his false claims and allegations through gullible foreign media correspondents, telling them among other things that his threat to force commercial banks to open up their books to unravel the whereabouts of the 'missing' funds whether $49.8 billion, $12 billion or $20 billion, ultimately led to his suspension. "He also continues to make the mischievous claim that the government is somehow involved in a scam to divert huge sums of money from the Federation Account through the misappropriation of kerosene subsidy funds. 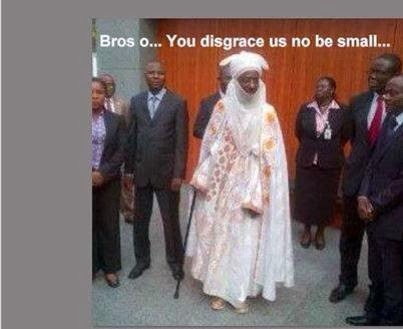 "Mallam Sanusi’s allegations are patently untrue. But government is making no effort to bury them as he falsely claims. Relevant committees of the National Assembly are still investigating the claims and the suspended CBN governor remains free to give evidence before them in support of his allegations. "Furthermore, in keeping with its avowed commitment to full transparency, openness and accountability in governmental affairs, the federal government has authorised the engagement of reputable international firms for the recommended forensic audit of NNPC accounts," the statement said. The presidency however condemned Sanusi’s resort to playing politics with serious national issues. According to the presidency, "his (Sanusi) suggestion that the phantom missing funds may have been diverted to fund campaigns for next year’s general election is mischievous, irresponsible and designed to incite other political parties and members of the public against the federal government. "The presidency would not ordinarily have wished to join issues with Mallam Sanusi who as CBN governor remains an appointee of the president, but the very unacceptable manner in which Sanusi has been misinforming the public made it imperative that this statement be issued." Also responding to a suit filed by Sanusi against his suspension, the president challenged the jurisdiction of the Federal High Court, sitting in Abuja, to hear the suit. In a preliminary objection filed on his behalf by his counsel, Dr. Fabian Ajogwu (SAN), dated March 11, Jonathan formulated one issue for determination by the court which is that whether in the light of section 254C(1)(a) of the constitution, the Federal High Court has the jurisdiction to entertain the suit. He argued that by virtue of Section 254C(1)(a) of the constitution, the National Industrial Court is the appropriate court vested with the jurisdiction to entertain the matter. Jonathan stated that since the dispute relates to matters arising from the employment of Sanusi by the Federal Government of Nigeria represented by the president, it was the industrial court that should adjudicate on the matter. The case, which is currently before Justice Gabriel Kolawole, has been adjourned until March 19, for mention. Sanusi had in an originating summons filed by his lawyer, Mr. Kola Awodein (SAN), sought a declaration by the court that Jonathan has no statutory power to suspend him from office as governor of the CBN. He asked the court to restrain the president, the Attorney General of the Federation and Minster of Justice and the Inspector General of Police, who are also defendants in the case, from giving effect to his purported suspension from office, pending the determination of the suit. He equally asked the court to make an order of interlocutory injunction restraining the defendants “from obstructing, disturbing, stopping or preventing him, in any manner whatsoever, from performing the functions of his office as the governor of the CBN and enjoying in full, the statutory powers and privileges attached to the office.” Urging the court to expeditiously grant his interlocutory application, Sanusi maintained that any delay might cause irreparable and serious damage and mischief on him in the exercise of his statutory duties as the CBN Governor. He said: “The president’s continuing unlawful interference with the management and administration of the apex bank, unless arrested, poses grave danger for Nigeria’s economy.” He insisted that the danger his suspension posed to the economy was enough reason for the court to grant his application and as a result make an order for status quo ante bellum to enable him to return to his office as the Governor of the CBN.